The Indian PM’s visit to the US was high profile, but what about practical outcomes? If the New York component of his trip should be best characterized by the drama of “rock star” gatherings in Central Park and at Madison Square Garden—a welcome put on entirely by the all-volunteer Indian American Community Foundation—then what of the Washington part of the visit? Early media coverage of his Washington meetings, including a panel discussion in which I participated with TimesNow’s Arnab Goswami, asked whether it was “all sizzle and no steak” or whether some real outcomes resulted from the government-to-government meetings. From a policy perspective, the successful reset of ties after a very difficult year stands as the primary outcome. Looking toward the future, as the joint statement puts it, both sides will work toward principal partnership from the United States in “the realization of India’s rise as a responsible, influential world power”; and “cooperation in every sector for the benefit of global stability and people’s livelihoods over the next ten years.” The statements have hardly generated rock star coverage (almost nothing in the policy world does, apart from crises), but do delineate a top-level reaffirmation of the commitment Washington made to India back in 2005. Notably, none of the current difficulties bedeviling bilateral economic ties have been resolved. The disagreements over civil nuclear liability, intellectual property rights, local content requirements, visas, social security contributions, global trade, and other matters are not easy to bridge. These appear to have been delegated by both leaders to working groups. I do not anticipate fast resolution of these disputes, as some would require legislative changes, and neither capital has a beneficial political configuration for legislative action. More fundamentally, a close reading of the policy documents issued by the White House and the State Department indicates broad continuity with, rather than dramatic change from, the past decade of U.S.-India bilateral initiatives. In addition to the vision statement and the more comprehensive joint statement released by the White House, the State Department issued nine fact sheets detailing bilateral cooperation in: strategic consultations; trade and economics; security; higher education and skills development; health;energy and climate change; development; promoting women’s empowerment; and civil space and technology. The new elements within each of these build on previous work rather than departing into completely new areas. For example, the pledge to establish an Indo-U.S. Investment Initiative with “special focus on capital market development and infrastructure” could be seen as a natural extension of earlier discussions that produced the Infrastructure Debt Fund in India. A plan to reinvigorate the Higher Education Dialogue, established in 2012, will support sharing of expertise in skills development. A commitment to expand the successful work of the Partnership to Advance Clean Energy adds new elements like integrating renewables into India’s energy grid, and creating new innovation centers. Recognition of the Montreal Protocol as an institution for use in reducing “consumption and production of HFCs” resembles the statement issued after the meeting between President Obama and Prime Minister Manmohan Singh last September. Absent the conclusion of deals under the Defense Trade and Technology Initiative launched two years ago, the focus for defense ties appears to be on enhancing and upgrading successful military cooperation in maritime security, naval technology, and exercises. A strong comment on the “continued threat posed by terrorism” adds ISIS as a new threat to the list of shared terrorist concerns. (Here, I should parenthetically note that the United States designated Lashkar-e-Taiba and Jaish-e-Mohammad thirteen years ago, adding the D-Company in 2003 and the Haqqani Network in 2012, so this focus does not represent belated attention.) Information sharing in the defense, security, and law enforcement space received a pledge for enhancement. Expanded cooperation in high technology, space, higher education, and health—along with the vision statement sentence prioritizing “the currents of kinship and commerce, scholarship and science”—illustrates a deepening at the project level of these noncontroversial areas where substantial collaboration has been underway. Some of the notable new elements include: a Mars working group, surely building on the recent news of India’s successful Mangalyaan entering into the Mars orbit; partnership on a Digital India initiative; an Indian initiative to host 1,000 American academics to teach in Indian universities; cooperation on combating Ebola; further work to develop affordable vaccines for diseases like “dengue, malaria, and tuberculosis” and collaboration on cancer research. In looking at the global landscape, the Modi visit appears to have resulted in some stronger public statements of shared concern over global affairs. 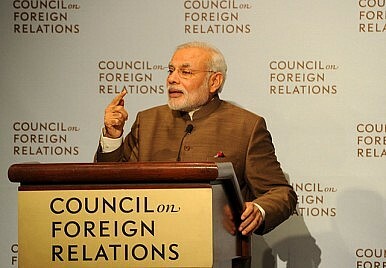 His speech at the Council on Foreign Relations contained perhaps the frankest public statement ever made by an Indian prime minister on India’s fears of regional chaos resulting from the drawdown of international troops; he referred to what had occurred in Iraq after U.S. troops departed, describing ISIS and the beheading of journalists, to convey India’s hope that the United States and the international community reconsider their timeline for Afghanistan. Similarly, the joint statement from the Modi-Obama meeting pledged consultation on “unfolding events in Syria and Iraq” and noted shared concerns about North Korea’s nuclear weapons program. In the past, reference to these global security crises might have been backgrounded to the press rather than appear in a formal statement. So: the outlines of U.S.-India relations under Modi are coming into focus. We are seeing not a dramatic reshaping of ties, but what appears to be a careful building upon initiatives already underway. Within that, I would describe some of the new elements as demonstrating an increased focus on specific projects that leverage the technical capacities of both countries. It’s more of a practical emphasis on concrete collaboration in fields like development, health, clean energy, civil space, and higher education. Mr. Modi is bringing his pragmatic orientation to diplomacy, steering India’s ties with the United States toward projects and a practical, getting-things-done approach. Indian Foreign Policy After the Elections: All Eyes on ChinaContinuing Convergence: India-US 2+2 Meeting Shows Inexorable Progress in the RelationshipPompeo Heads to Pakistan to Take on Terrorism, Seek 'Reset'What the US Iran Sanctions Mean for IndiaWhat’s Next for India-US Relations?